Researchers at the Computer Science and Artificial Intelligence Laboratory (CSAIL) – the largest research laboratory at MIT – have developed a system called “C-LEARN,” which allows robots to teach other robots. 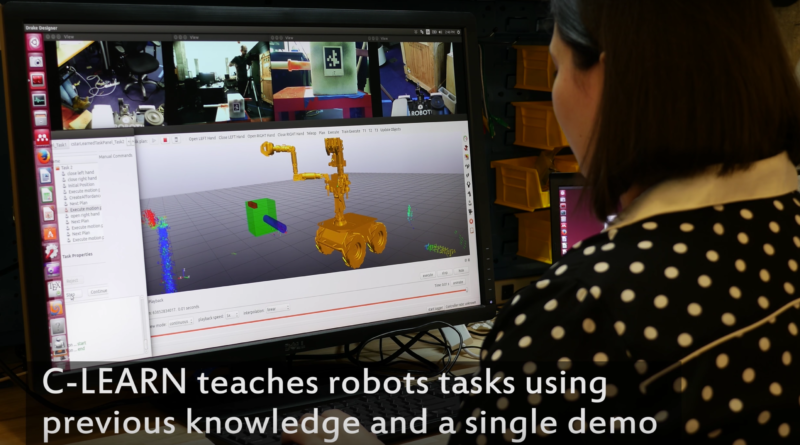 Prior to C-LEARN, robots learn in two ways: first is through learning from demonstration, in which they watch how a task is being done and then imitate it; and the second approach is through motion planning techniques, in which a programmer hand-codes the robot’s tasks and limitations. “This approach is actually very similar to how humans learn in terms of seeing how something’s done and connecting it to what we already know about the world,” Pérez-D’Arpino said in a statement. The MIT researchers have tested the new method on Optimus, a new two-armed robot created for bomb disposal. The researchers programmed Optimus to perform tasks such as extracting objects from containers, transporting objects and opening doors. The MIT team demonstrated that by using C-LEARN, Optimus’ skills could be seamlessly transferred to Atlas, a 6-foot-tall, 400-pound humanoid robot owned by CSAIL. C-LEARN is still a work in progress. To date, the system cannot yet handle complicated tasks such as evading collisions or planning for different step sequences for a given task. The MIT team hopes that C-LEARN could one day be used in assembly manufacturing and aircraft or ship maintenance.